At an event this week at Mackey Arena, two prominent Purdue Coaches announced they would be teaming up with Hunger Hike as honorary co-chairs to join the Fight Against Hunger. Honorary Hunger Hike Co-chairs, Coach Sharon Versyp (women’s basketball) & Coach Dave Kucik (rowing & crew). Both spoke passionately about the importance of Hunger Hike and the power of coming together as a community to Fight Hunger. They also put out a challenge to the entire community to start fundraising now to reach this year’s Hunger Hike goal of $115,000. Representatives from the three sponsoring organizations — Lafayette Urban Ministry, Food Finders Food Bank, Inc. & St. Thomas Aquinas Center — also offered remarks and shared how important this fundraiser is to funding the programs necessary to addressing the needs of the families in our community and abroad. For more information on how you can begin fundraising for Hunger Hike see below or go to our website — hungerhike.org. 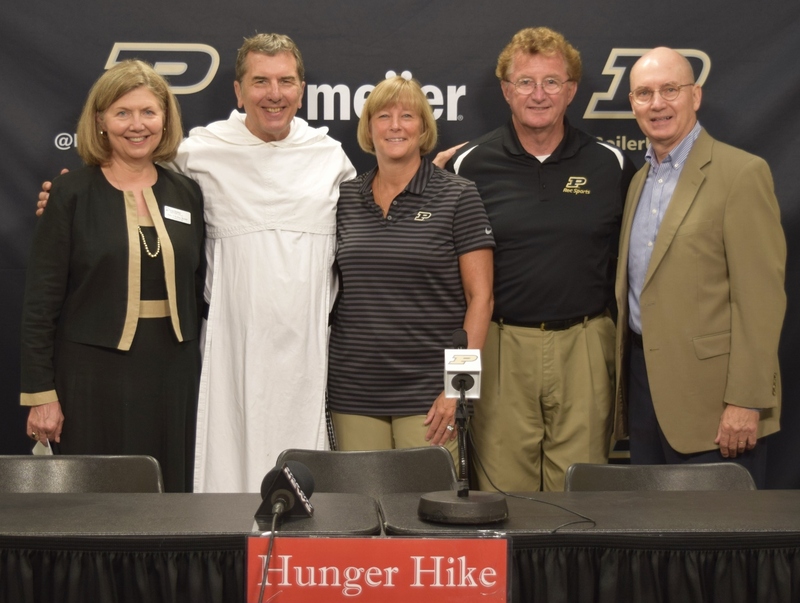 West Lafayette, IN – Three prominent Purdue coaches have teamed up to fight hunger by participating and promoting Hunger Hike 2016. Coaches Sharon Versyp (women’s basketball), Dave Shondell (women’s volleyball) & Dave Kucik (rowing & crew) will be speaking out about the issues of hunger in Indiana and encouraging participation in one of the longest running, most well respected fundraising events — Hunger Hike. Representatives from the three sponsoring organizations, Lafayette Urban Ministry, Food Finders Food Bank, Inc. & St. Thomas Aquinas Center, will be available for questions and one-on-one interviews. For more information on Hunger Hike 2016, please visit our website at www.hungerhike.org. Hunger Hike is an annual Fall community fundraising weekend which includes the traditional 3K Walk on Sunday as well as a 5K run on Saturday. This year Hunger Hike is Saturday, September 17 & Sunday, September 18, 2016. All Hunger Hike proceeds directly support the Lafayette Urban Ministry food assistance programs including the St. John’s/LUM Food Pantry, Food Finders Food Bank, Inc., and St. Thomas Aquinas Center’s Haitian Ministry including the Haiti Water Purification Project. Since early 1990s Lafayette Urban Ministry, St. Thomas Aquinas Center and Food Finders Food Bank, Inc. have been organizing a walk to support food programs locally, regionally and globally. Formerly known as the Crop Walk, it was officially renamed Hunger Hike in 1993.